Brent and I have spent a lot of time in poorer countries these last few years. Right now, we’re in Thailand, which ranks 83 out of 189 countries on the of the Human Development Index (which isn’t bad). The average annual income here is about $3,300 US (compared to $40,000-$100,000 in Europe and the US). But people make more in the big cities like Bangkok, and less in places like Koh Lanta, the remote island near Phuket where we’re living. Which makes us ask the question: Should Brent and I try to barter down the price of a tuk tuk to take us across the island? It usually costs less than three dollars, but it’s easy to get it down to two. One friend argues that we shouldn’t drive up the price of a tuk tuk ride, because when the drivers learn they can make so much more taking Westerners, they stop picking up the locals — or charge them more. On the other hand, the extra money is injected directly into the local economy, which makes everyone richer. What is the impact of richer travelers coming to poorer parts of the world? It’s something we think a lot about. In many beautiful but poor places, wealthy outside businesses come in and build resorts and fancy restaurants, and most of the income they generate flows back to those wealthy investors. But we never stay in those resorts. And here in Koh Lanta, very little money is going to big corporate chains. There are no McDonalds, Pizza Huts, Wal-Marts, or Holiday Inns here. Most restaurants, shops, and accommodations are owned by locals. For a recent snorkeling trip, we hired a local man and his son, our money going directly to his pocket. They spoke zero English, and I kept thinking the kid was going to drop the cigarette his dad gave him into the gas tank, but we still prefer to support the local economy. On the other hand, everywhere we travel, we hear stories of wealthy local interests controlling most of the resources, and that’s true in Thailand too. There’s a definitely caste-system-of-sorts here. But there doesn’t seem to be extreme poverty. People seem fed and clothed, and — this is the real barometer we always use — the children seem bright and healthy and active. They’re playing — happy, not listless. Most families seem to own at least one scooter — though we still haven’t gotten used to the sight of an entire family on one scooter, usually with no helmets worn, and with infants being held in one arm. And most Thai, even the poorer tuk tuk drivers, seem to have a smart phones. Maybe that’s essential for a businessman even here. But anecdotal evidence isn’t worth very much. 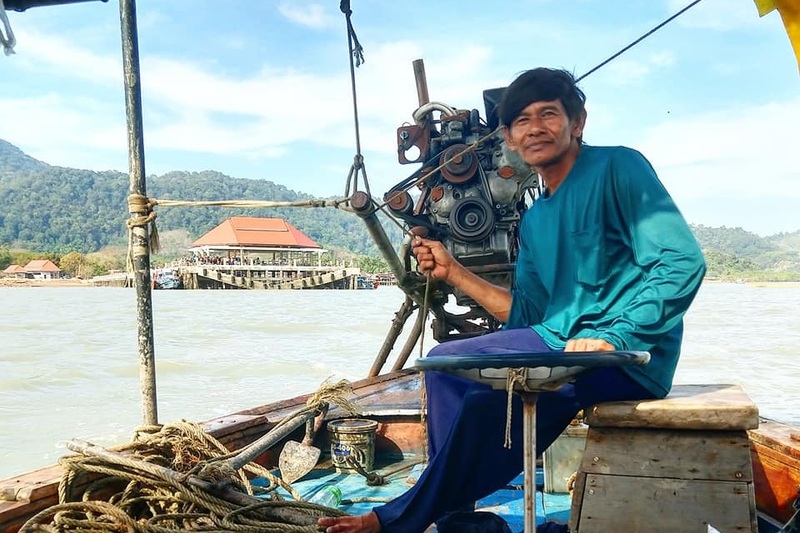 There are no concrete answers I could find about Koh Lanta, but some research turned up three articles that seem to paint a good, if not perfect, outcomes for poorer countries when it comes to tourism. This article about a poor village in Rwanda dives down to the micro level and show great benefits. Meanwhile, this article from the United Nations World Tourism Organization and another from the Overseas Development Institute both say tourism in poorer areas is critical to lifting them out of poverty, but governments need to be sure to help spread the wealth. Things aren’t perfect here in Koh Lanta. In the locally-owned lodging where we’re currently staying, there’s a row of nice bungalows for Westerners along the beach, and then a row of much more primitive bungalows (with equally primitive plumbing) farther back. But we’re doing the best we can to buy local. As for bartering with the tuk tuk drivers, we still do, because we want to respect local customs, and we also don’t them thinking we’re complete rubes. But I confess: we make a point not to drive a very hard bargain. And then we tip generously.